Zainsipilu is a small bandit cave southeast of Hla Oad. The cave is situated across the Odai River, on the west side of the mountains that follow the road. It has two branches of tunnels that lead to three major areas, the first being the slave den, second is the warehouse, and third is the bandits' quarters. 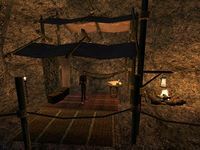 In the third phase of building your House Hlaalu Stronghold, Dondos Driler asks you to eliminate the eight bandits in order to secure the safety of your egg mine. Dunmer Rogue 7 79 98 0 90 He is the leader of the bandits. Nord Barbarian 7 98 70 0 90 He has the Zainsipilu Slave Key. 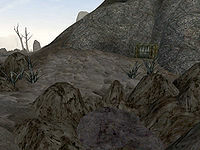 Various crates are strewn about the cave, many with leveled enchanted items, gold, leveled weapons and armor, and alchemy ingredients. It's possible to get soul gems from the randomly generated items in the crates of this cave. Unlocked chests typically contain potions and other leveled items. The highest lock level for chests is level eight. There is a hidden thief ring below the hanging bridge where the ladder runs into the water. It is situated on top of a rock that has one of the bridge's supports going through it with a few gold coins scattered around the ring. This page was last modified on 28 February 2019, at 04:58.